Coffee break dates and times have changed, to allow more people to participate. Coffee break is now on Mondays and on Thursdays at 9:30am in the NRC (CPM conference room). The first year of the Center was very successful, and we have all of you to thank for that. Your participation, involvement and enthusiasm made all of this possible! Hopefully, this initial success is just the beginning, and we look forward to expanding our collaborations and interactions with all of you to further advance science and biomedical research here at Wake! 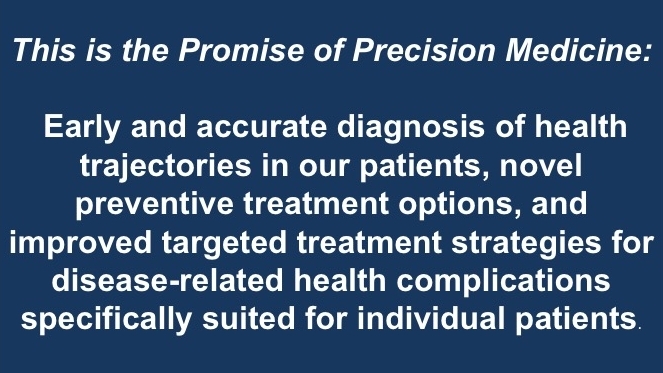 What is the Center for Precision Medicine about? Welcome to the Center for Precision Medicine at Wake Forest School of Medicine. The Center was launched in December 2017 to foster collaborative interdisciplinary research into the causes of common human disorders, such as heart disease, diabetes, obesity, and other aging-related morbidities. The Center promotes the use of state-of-the-art technologies in genomics, proteomics, metabolomics, and computational biology to explore the biological mechanisms underlying these disorders to improve diagnosis and treatment of patients. In current clinical practice, we will usually diagnose most chronic diseases once they have already significantly impacted the overall health of a patient. As a result, treatments may slow disease progression and reduce the severity of disease-related health complications, but they do not reverse the impact of these diseases on our long-term health. The focus of our research efforts is to identify and understand the early molecular changes in our cells and organs that precede the development of clinical symptoms of these diseases. These molecular indicators of health status and health trajectory will help identify individuals at risk for health complications very early in disease progression and open the door for development of targeted, preventive treatments to correct the health trajectory early, allowing patients to live long healthy lives. Understanding these early molecular changes will also provide new opportunities to develop more targeted treatments with fewer side effects and higher efficacies to improve the lives of patients already affected by these diseases.